Intermediate filaments are a primary component of the cytoskeleton, although they are not found in all eukaryotes, and are absent in fungi and plants . These filaments, which extend throughout the cytoplasm and inner nuclear membrane are composed from a large family of proteins that can be broadly grouped into five classes. IF assembly begins with the folding of IF proteins into a conserved alpha-helical rod shape, followed by a series of polymerization and annealing events that lead to the formation of filaments roughly 8 to 12 nm in diameter. Different IF combinations are found in different cell types, however not all IF classes will interact with each other. In contrast to other cytoskeletal components (e.g. actin filaments, microtubules), intermediate filaments lack polarity, are more stable and their constituent subunits do not bind nucleotides (such as ATP) (as reviewed in ). Numerous lateral interactions and fewer longitudinal interactions between constituent protofilaments within an IF generates high tensile strength and makes IFs resistant to compression, bending, twisting and stretching forces. (B) Microtubules have more longitudinal interactions between constituent tubulin dimers within protofilaments and fewer lateral interactions between protofilaments. 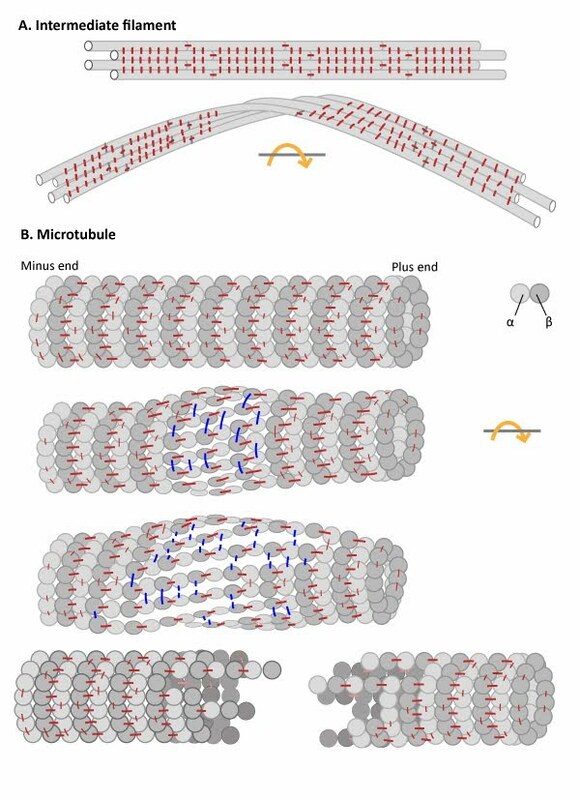 The stable longitudinal interactions within individual protofilaments promote rigidity within microtubules, making them resistant to bending and compression forces. In contrast, the weaker lateral interactions between protofilaments are susceptible to breakage when stressed by twisting forces. The tight association between protofilaments provide intermediate filaments with a high tensile strength. This makes them the most stable component of the cytoskeleton. Intermediate filaments are therefore found in particularly durable structures such as hair, scales and fingernails. The primary function of intermediate filaments is to create cell cohesion and prevent the acute fracture of epithelial cell sheets under tension. This is made possible by extensive interactions between the constituent protofilaments of an intermediate filament, which enhance its resistance to compression, twisting, stretching and bending forces. These properties also allow intermediate filaments to help stabilize the extended axons of nerve cells, as well as line the inner face of the nuclear envelope where they help harness and protect the cell’s DNA. Keratin proteins comprise the two largest classes of intermediate filament proteins. Historically, the two types of keratin were grouped as acidic (type I) or basic (type II) according to the overall physical properties of their composite amino acids. Keratin proteins first assemble into dimers, with one acidic and one basic chain, then into protofilaments and finally into IFs. In 2006, a universal nomenclature for each of the then known keratin genes and proteins, which totaled 54 (28 type I and 26 type II), was established to achieve international consensus for their naming and classification . The expression of particular acidic and basic keratins can be cell type specific. Keratins are found in epithelial tissues and their expression can be altered during the lifetime of a cell. Keratins provide vital internal support and cohesion to epithelial cell sheets. For example, the basal layer of epithelial cells that constantly divide and give rise to new skin cells (keratinocytes) become filled with keratin filaments as they mature. The keratin filaments anchor the skin cells to the extracellular matrix (ECM) at their base and to adjacent cells at their sides, through structures called hemidesmosomes and desmosomes, respectively. 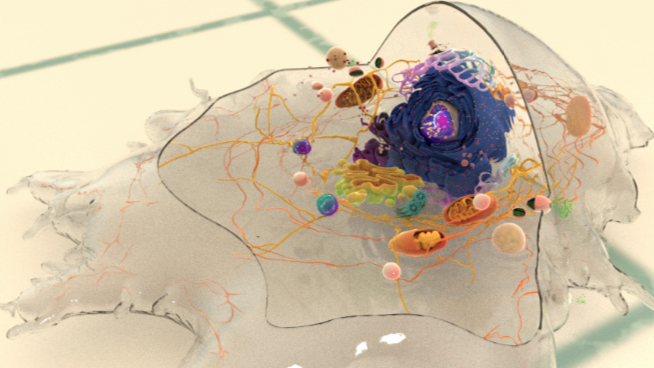 As these skin cells die, the layer of dead cells form an essential barrier to water loss. Consequently, mutations in keratin genes are known to be responsible for a variety of skin diseases. Keratin-containing structures are also located external to the epithelial cell layer (e.g. hair and nails).